Shangri La is a mythical land fabled in the scrolls of oriental culture as the ultimate destination for prosperity, and life affirming lifestyles. Otherwise known as enlightment. Shangri La is a wonderful game by developers NetEnt and takes on a different approach to the 5 reel method taking by most slots. 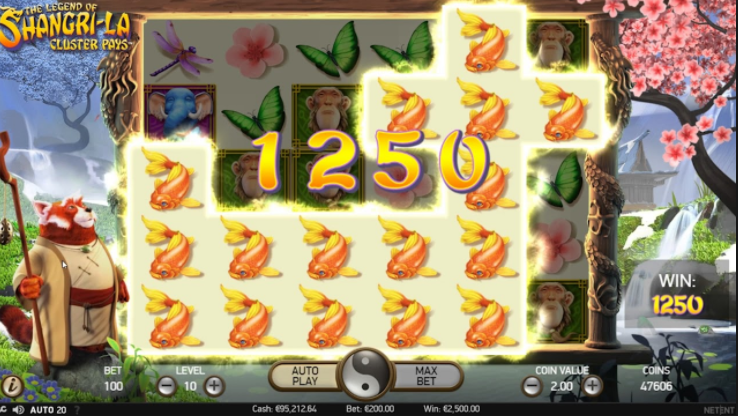 In this slot game you win cash by locating and amassing clusters across a gameboard. Immerse yourself into this ancient Chinese paradise and earn some lovely cash prizes. If you were given three guesses as to who was the best online slot developer in the land, one firm that would certainly arise would be NetEnt. After their advent in the late 90s they have went from strength to strength, firstly designing the first internet slot games and then progressing onto the cinematic video slots that we are familiar with today. They are responsible for many of the casino games that we know and love today including games that feature across the Easy Slots platform like Starburst and Emoji Planet. Shangri La is a fictional safe haven that rose to prominence following the 1933 novel Lost Horizon, by James Hilton. Shangri La is described as an all-knowing, all-seeing settlement enclosed in the Kunlun Mountains. This beautiful land became synonymous with peace, serenity and that human affliction; paradise. Nowadays, it’s began to gain other associations, more recently with 5 reel slot games that are simply wonderful to play. The Legend of Shangri La: Cluster Pays operates on a 5x6 tiled gameboard that sits on an ornate pillared pagoda in the heart of the Kunlun valley. In the background you will see a land filled with refreshing streams and oases, hanging cherry blossom and cascading waterfalls. The gameboard is overseen by a wise fox in a robe. Slightly on the overweight side this wise old creature is far from cunning and acts as some sort of slot game martyr with his benevolent presence. When you spin through the gameboard that’s aptly filled with water Lillies, butterflies, koi carp, and praying animal symbols, the fox will react to each and every spin with his reassuring affirmations. The graphics and design of this game is simply a joy to behold. The method of victory on this game is found when you match the same symbols on the game in adjacent manner, this means either vertically or horizontally. The more you match the more cash you can win. The smaller value symbols of the game are the flowers, butterflies, dragonflies and koi carp while they big payout symbols are the praying monkey and the wise old elephant. The payouts increase with every additional cluster that you seize. It is possible to cover the whole gameboard with the same symbol, manage this and you will certainly be winning some sort of jackpot. There’s also some special features among this game that you should be made aware of. Occasionally, tiles on the gameboard will change to question marks – these can be accessed and changed to match any symbol you need to complete your cluster. Another feature called the STICKY SPIN RESPIN can be activated when you have 2 or more clusters of the same icon. These respins will continue to surprise you until you better the hand that you had at the start of the round. The Legend of Shangri La: Cluster Pays is one of the best original games that NetEnt has brought out to date. The theme and graphics are perfect, they transport you to a far eastern world that tops any oriental slot that’s currently on the market. Shangri La also offers something quite unique in it’s gameboard that offers Clusters rather than paylines and that is something that fans of Aloha Cluster Pays may love. 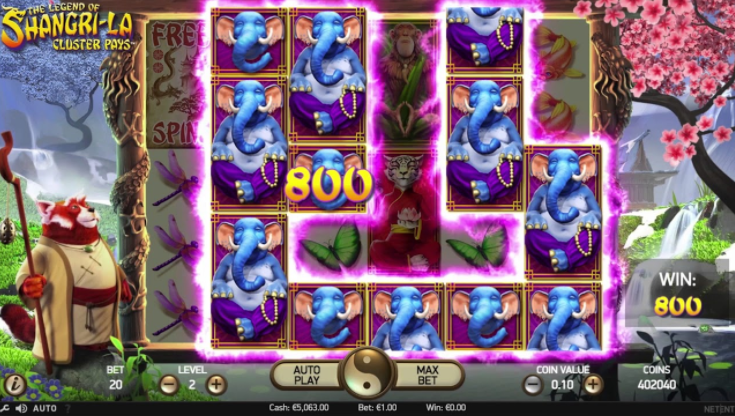 This slot game is well worth a deposit simply for the spell-bounding graphics. Play some of Easy Slots other great games today.